Old homestarrunner reference, don’t ask. Why’d Loki take the pieces? Guess he liked those weapons better that waaayyyyy! That’s one of the signs that Ragnarok is imminent, isn’t it? Luckily no! Otherwise TMK definitely will never come back. No, Coal voluntarily smiling in happiness is a sign of Ragnarok’s approach. Other signs include Ibrahim willingly travelling, Hedda doing something mean, and Loki going a day without pranking. Indeed.And the chances of THAT happening are…. NOPE! Haha, no, I can’t wait for the book to come out. I’ll buy one! …Dang it, I came out of lurkerdom. Oh well. Thank you for coming out of lurkerdom. :3 And thanks for not throwing tomatoes. It’s nice to have supportive readers! I’d like to come out of lurkedom too. Your comic is fantastic and I like it and I told my friends and they liked it and I hope you will get your lucky break and find time soon and please don’t go away we lost so many already where are you all going, it’s like webcartoonist’s famine out here I have like ten bookmarks oh hold PLEASE PLEASE BE BACK. Haha, relax Varg! I said I’d be back, I even gave a timetable. I’m still working on TMK stuff, I just can’t show you guys yet. I hope when I get the Kickstarter together you and your friends will think of ordering. 😀 Thank you! Thank you! Hopefully it won’t take too long, but it’ll definitely be a couple of months at least. >_< Uagh. 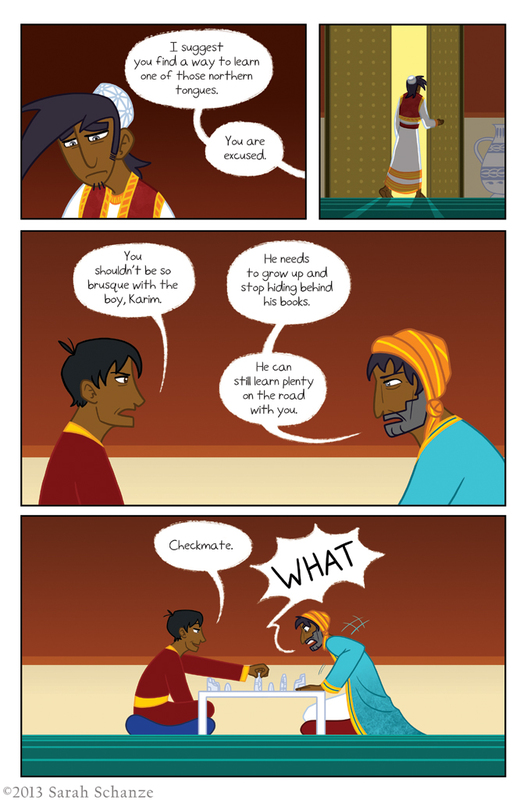 Why is Uzair making a grumpy face in the fourth panel ? He doesn’t like that Karim brought up Constantinople. Can we send you fanart and/or guest pages to fill in some stuff? Oh, sure! I had sort of thought of doing that, but wasn’t sure there was enough interest. I’ll ask next week if anyone wants to do that! 😀 Thanks! (*whining*) But I just started reeeeaaaaadiiiiiiiiing!!!!!!!! The story is interesting, the artstyle is eye-catching and fitting for the characters, and I bet a lot of people cannot wait for more! Oh boy I am psyched! This is way cool, a book! Yep! It won’t be for a while, but I’m hoping to get it done before fall! We will see. Hmmm. In the face of a hiatus, I’ll also come out of the silent web shadows and say I’m pumped for a print volume! Thank you for coming out of the shadows! I’m glad people seem to be understanding and excited for the print volume. And I’m afraid Ibrahim won’t be bringing the chess set. He will have to travel light. Got a long way to go! Crap! I started reading this comic yesterday, and I’m already here. I can’t imagine my future life without this comic! Haha, sorry for the abrupt change! Thank you for reading though. And don’t worry, it’ll come back soon! Also, thank you so much! I’m glad you miss Coal. :3 He’ll be back, don’t worry!